At age 17, Andrew became a telegraph operator with the Pennsylvania Railroad Company. He thought outside the box, suggesting the telegraph office stay open twenty-four hours a day. In eight years, Andrew was one of the bosses. With the money he earned he invested in the railroad and other companies that produced oil, iron, and steel. By age thirty-five he was a very rich man. 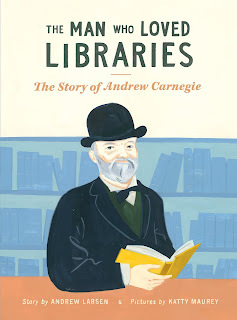 As a young man, Carnegie always knew that learning was the key to his future.” He loved books and made time to read them. After he became rich, he wanted to build libraries so that others, regardless of their income, could have free access to books. In 1891, Carnegie Hall in New York City opened its doors, and still continues to welcome some of the world’s greatest performers. Larsen’s picture book biography keeps a positive tone while offering just the right amount of information about Carnegie’s passion for learning. Maurey’s illustrations reflect what is discussed in the text. Back matter includes a brief bibliography. In the author’s note, Larsen does mention that Carnegie, though generous with giving back to the community, was also a ruthless businessman. In 1892, his steel company, The Carnegie Steel Company, crushed the steel workers’ union. As someone who will forever be grateful to my high school librarian for opening up my eyes to how libraries can change the world, this is a timely celebration of the man and the importance of public libraries. Is there a Carnegie library in your community? To write this review, OwlKids Books sent me a copy of the book.